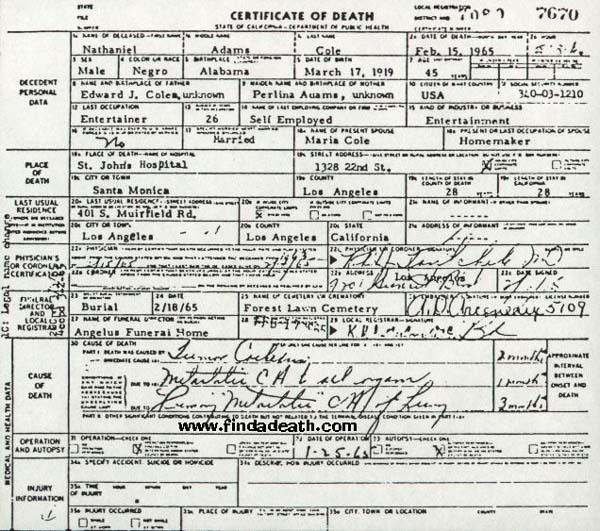 Nathaniel Adams Cole was born in Alabama in 1919. He came a long way. 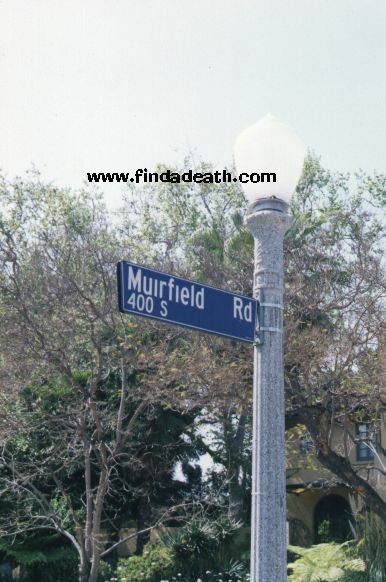 He lived on S. Muirfield, in the Hancock Park area of Los Angeles. When he bought the house, uptight Caucasian Angelinos formed a committee to tell Nat that they did not want any “undesirables” living in their community. His reply was, “If any move in, I’ll let you know.” I love it. The house was located at 401. Wanna see the front door? He married twice, his second wife being Maria Hawkins, a singer with the Duke Ellington Band. Nat had a daughter from his first marriage named Natalie, they adopted Maria’s sister’s daughter Carol, and they adopted a son in 1959 named Nat Kelly Cole. In 1961, Maria gave birth to twins, Timolin and Casey. 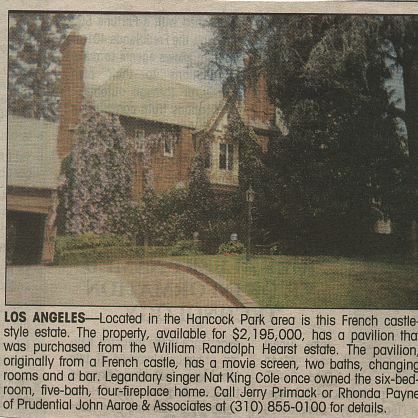 I was reading the page on Nat King Cole and I found what I believe is an error. Natalie is the child of his second wife. There were no children from his first marriage. A good source for this is the biography by Daniel Mark Epstein. It was the best biography I had ever read. Maria actually was one of the contributors of info as well as Nat’s brothers and sisters. According to the book, Nat had trouble with his sperm count and had to take injections. That is why in earlier pictures, his skin looked so smooth as he didn’t have to shave until the injections. Nat didn’t start the injections until after his marriage to Maria. Get the book… it’s great. Shortly before he died, he had a singing and acting role in the film Cat Ballou. Nat was a chain smoker, often inhaling 3 packs of cigarettes a day. From what pitifully little information I could find, the cancer in his lungs was only discovered 3 months before he died. 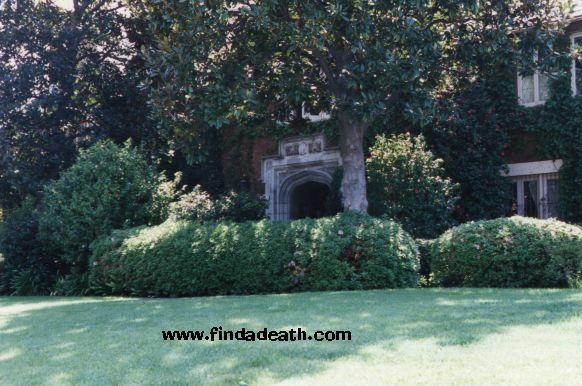 where he succumbed to lung cancer on February 15th, 1965. He was only 45 years old. I am reprinting this story which my mother, Chris Michaels gave me (yes, she approves), that appeared in a Detroit newspaper a while back, written by a man named Mort Crim. Don’t know where he found it, or it is true, but it is very touching. It was 11:30 at night. The older black woman was standing beside an Alabama highway, bracing herself against a lashing rainstorm. Her car had broken down. She desperately needed a ride. Soaking wet, the woman decided to flag down the next car. The young man who stopped to help was white – something generally unheard of in those conflict-filled days. It was the 1960’s. The young man took the woman into town, helped her get assistance, then put her into a taxi. She seemed in a hurry and quickly wrote down the man’s address, thanked him, then drove away. “Thank you so much for assisting me on the highway the other night. The rain drenched not only my clothes but also my spirits. Then you came along. “Because of you I was able to make it to my dying husband’s bedside just before he passed away. God bless you for helping and unselfishly serving others. My only problem with that story is that she was in Alabama, and Nat died in Santa Monica. It also sort of says that if you helped a black person in the 60’s, you’d get a television set. Again, nice story, but I wonder about it. Nat is buried in the Freedom Mausoleum, at Forest Lawn Glendale. In 1985, Nat was inducted into the Music Hall of Fame, in Alabama, his home state. 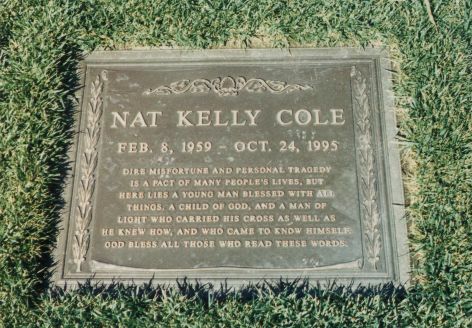 His son Nat Kelly Cole died of AIDS in 1995. He was 36. His funeral was held at St. Victor’s Catholic Church in West Hollywood, and he is buried not far from his father, in Forest Lawn, Glendale. Natalie Cole was a mediocre at best singer for many years. After years of failing to become successful, she decided to copy her father’s work and put out the album,Unforgettable. Natalie’s sell out (in more ways than one) album was really good. I hated the fact that she did it, but it was really good, and she won lots of awards for it. Unfortunately, she spawned a new revolution of singer’s children performing duets with their dead parents. I hear Lorna Luft did it, but I’ve yet to hear that atrocity. Friend of Findadeath.com Jackie Smith sent this piece of very good trivia: “He (Nat) and my mom were very good friends (not THAT good!). In fact, she tells me a story that when they first met (in late 1963), she was at a cleaners on Jefferson and 3rd Ave in Los Angeles (where all da middle class black peoples lived at the time). He walked in and she got so excited that she almost DROPPED her 3 month old baby daughter (yes, fans it was ME!!). Thanks a lot, MOMMA!!! Anyway, She remained friends with the family (my mom even claims Natalie babysat me a couple of times–I can’t confirm or deny!). Both my parents went to Nat’s funeral in 1965. After Nat died, my parents really didn’t keep in touch with the rest of the family. See how LA people are!” Thanks Jackie! Any scoop on the funeral? Trivia: Nat was an avid sports fan, had his own box at LA’s Dodger Stadium, and named one of the twins Casey, after Casey Stengel. 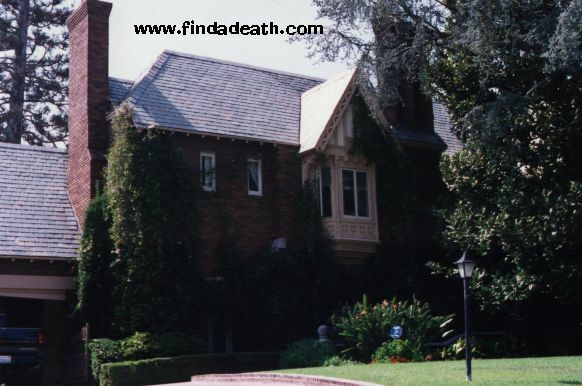 More Trivia: The house on S. Muirfield went up for sale in late 1999. 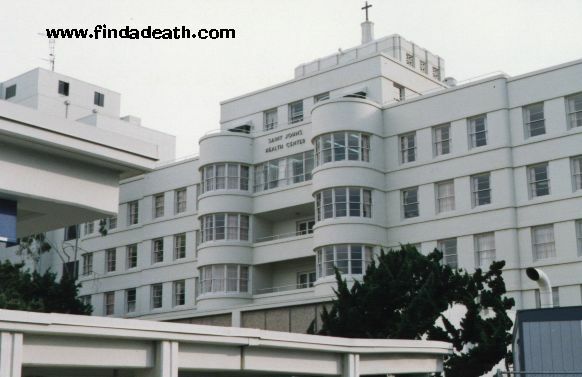 Thanks to Findadeath.com friend Roger Sinclair for the listing. 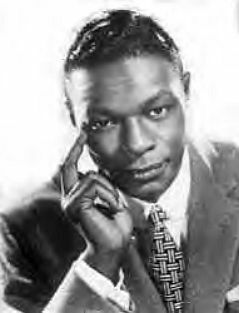 More Trivia – sent by my good friend Steve Smith: Postscript on Nat King Cole. He was born March 17, 1919. My friend at work goes to the same church as Natalie does and said that, only when coaxed, will Natalie get up in front of the congregation and sing . . . or when she’s trying out new material . . . get it. Not that you care, but The Christmas Song is my all time favorite Nat song. From what I understand, Nat’s last live concert was at the “Circle Star Theater” in San Carlos, CA. It was the kind of place that had a stage that circled around and around, as the artist performed. Back in the 60’s,70’s, and 80’s, the CS was a venue that offered many popular shows. 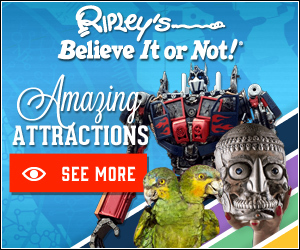 I personally saw “The Chairman of the Board” and the Osmonds. In fact, Frank (who was into art) drew a self portrait on a wall in the dressing room. Someone cut the wall out before the CS was demolished in the late 80’s (I’d love to see what happened to that part of the wall. It’s got to be out there someplace). An office building stands now where the CS once stood. I pass it all the time, and think fondly of those old times. 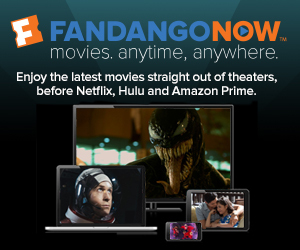 Thanks again for a GREAT web site. Hopefully I’ll see you for James Dean’s 50th. If you need a place to crash at that time, you’re welcome at my house, since I now live in Santa Cruz. Any way, thanks again for some great info.